When it comes to speedy backup of disk image, an ideal imaging software in 2018 must be able to perform backup with fewer clicks. 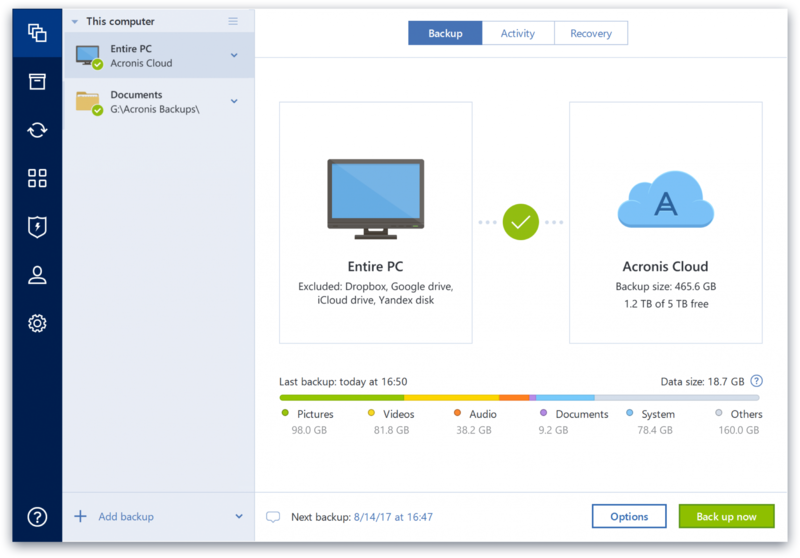 Acronis Backup 12.5 for instance can perform a complete backup with just 3 clicks, and it will take just 15 seconds to recover images, hence it may be one of the most reliable backup software for business owners. The Acronis Backup 12.5 advance may provide even faster and easier backup and restore however it is more expensive than the standard version. Aside from the main backup and restore, ideal backup software must also provide full backup, incremental backup, differential backup and clone backup (disk image) at incredible speeds. While the main backup for software like Acronis Backup 12.5 can take 15 seconds to complete, full backup should take few minutes, while incremental backups, differential backups and clone backups should take few seconds to complete. Scheduled and event-based backups are desirable features in any disk imaging software, with scheduled backups, the software must be able to perform automatic recurrent backups of drive images, and with event-based backups, and the software must be capable of creating image-based backup, especially when some user-defined events happen. Reliability is one feature that should be of paramount interest to backup software users in 2018. Reliable backup software such as Acronis 12.5 and Acronis True Image 2018 are capable of reducing Recovery times to seconds especially through the Acronis Instant Restore feature. This feature is capable of starting your Windows and Linux devices directly from the backup storage either as a VMware or Hyper-V VM, and you don’t need any data movement or standby hardware for this. Ideal 2018 backup software must also provide flexible storage options which make it easy for the software to increase business resilience by storing your backups in multiple locations. For instance Acronis Backup 12.5 provides backup in 5 different locations, these are; SAN, NAS, Local disks, Tape, and the Acronis Cloud storage. For this reason, the software is very reliable when it comes to retrieving your files from multiple storage media. Ideally and backup storage software must come with private end-to-end encryption, and this can be found in top software such as Acronis True Image 2018, Cloudberry backup, and Handy Backup. The private end-to-end encryption is a security features whereby files are encrypted before they are sent to cloud storage. The encryption comprise of a private key that is only known to the user or file owner. Latest 2018 backup software such as Acronis 12.5 take a step further by making use of specialized features such as “Acronis Active Protection”, to safeguard the files being stored from ransomware attacks. This is the only known backup technology that is capable of detecting and preventing un-authorized encryption of your files and backups at any time. Aside from excellent security, larger backup sizes, tech support, and reliability, 2018 backup software is expected to come with better intuitive user interface. Good software can easily be detected through its user interface, especially the fluidity at which the user can navigate from one area to the other on the software. Upon the startup of ideal software it must come up with an easy-to-use “wizard” that can walk even the beginner users through the installation, backup restore and syncing procedures. It must provide easy to read options such as “what to backup”, “disk clone”, “disk image”, or you can even choose an entire drive or partition to backup. There are several added features that can further enhance the functions of real backup software. For instance, backup and disk imaging software such as Acronis Backup 12.5 provides native integration of Acronis storage which enables geo-replication, in addition to the Acronis storage feature. The software will also provide improved security features for Linux computer systems. In this case, administrators can easily log unto the server to make use of the Acronis Management Server to manage Linux system backup. 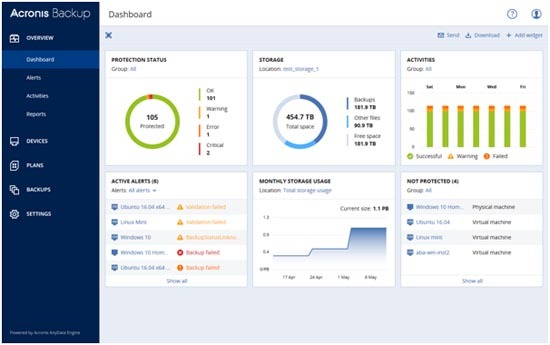 Advance 2018 backup software like Acronis True Image 2018 and Acronis Backup 12.5 do come with all-in-one VMWare feature which simplifies the deployment of Management server, backup console, Virtual appliance and Central operating system (CentOS), all these features make the software even more flexible in usage. Improved scheduling is another added feature expected in a 2018 backup and disk imaging software. This feature can provide backups on VPN, Wi-Fi and prevents the battery from entering a sleep mode. This means that you can still perform fast backup even when your device is flat on battery power. Double layer of protection, which included encryption, is also a common feature expected in the best backup software in 2018. Alongside this is a new email restore feature that makes email recovery very faster and easier. For instance the recovery of emails from Office 365 and Exchanger Server Mailbox will only take few seconds to complete. The price also matter a lot, so don’t forget to check Acronis discounts and promo codes to save upto 80% of the original price.